Day 13 (Part II): Bridging Gaps – and People – The San Francisco Bay Trail: It's Closer Than You Think! One of the most celebrated sections of Bay Trail will be one that connects Oakland with San Francisco for both pedestrians and bicycles and it can’t come soon enough. As the Bay Area eagerly awaits the completion of the new iconic eastern span of the Bay Bridge there is a very large contingent of us who are focused on a comparatively thin, fifteen foot wide stretch of the span cantilevered off the south side deck for 2.2 miles from Oakland to Yerba Buena Island. 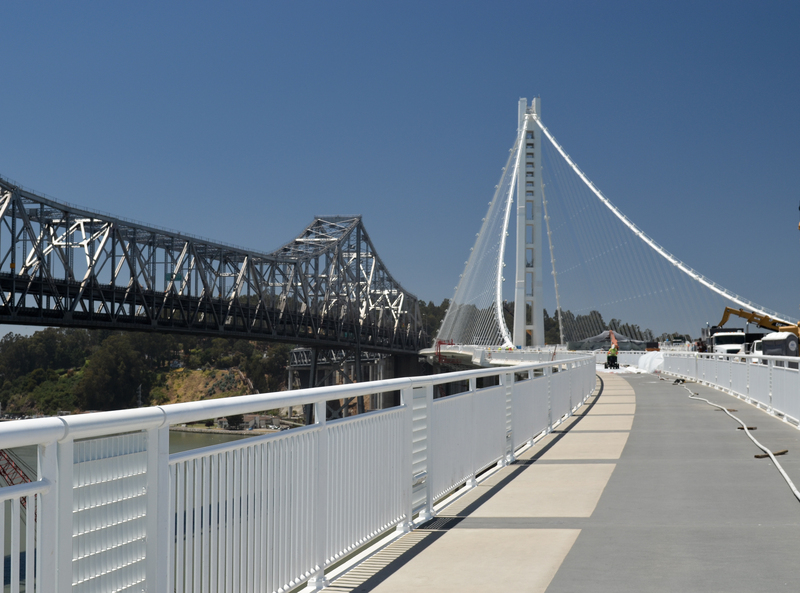 I got the call from Brenda last night alerting me to wear boots and jeans for the West Oakland Bay Trail hike since they would be required for what she had to say next – I would get a private tour of the new eastern span of the Bay Bridge if I was up to it. If I was up to it? Are you kidding? It was a no brainer and Brenda was at Jack London Square the next morning to whisk me off to the bridge after I completed the Emeryville to Oakland Bay Trail section. After literally inhaling the ham and swiss sandwich Brenda brought me and swallowing it down with peach Snapple, I got the opportunity to meet our guide, Lindsey Baker. We threw on our hardhats and fluorescent vests and were on our way. The circuitous route to base camp took us down a few Jeep rated roads and eventually up to the north side span before driving over a steel “connecting bridge” connecting the north and south sides of the span. As Lindsey explained in fascinating detail some of the engineering marvels behind the construction of the new span, we happened upon a guy dressed as we were but peering intently through a bird scope aimed toward the existing span. It was Eric Jepsen, a scientist from Garcia and Associates, tasked with tracking the scores of birds and bird species that call the existing eastern span home. Eric explained how the cormorants now nesting on the old bridge have been given particular attention on the new span. They have created “bird condo communities”, complete with staging, faux neighbors, and mirrors intended to entice them to move from their existing abodes under the noisy and seismically questionable span just to the south. We stopped for several minutes to take part in some bird watching and to see the new bird condos before continuing west toward the tower. However we would stop short in order to avoid the heavy construction zones ahead. We rested in the viewing platforms that extend from the path intermittently along the span so people can rest and take in the views safely without worrying about blocking cyclists or creating people jams. However before any pedestrians and cyclists can take these views in, a portion of the old span will need to be demolished first, a feat that will not be complete until summer, 2015. I made sure to capture both mental and photo images of this experience so I could recall every detail of being out there while history was being assembled piece by piece in front of me. The East Bay will surely have an iconic structure to admire and be proud of for generations. To have such a beautiful and elegant bridge connecting east to west and west to east is only fitting for such a unique community as we have here in the Bay Area.